With pride I introduce Tadulako which was founded in 1981 and is the only state university in Central Sulawesi province until today. The university is an option for children who come from various regions / districts and other cities throughout Indonesia. Standing on an area of ? ?250 hectares, the university campus to complete Tadulako improve facilities and infrastructure and create an atmosphere of academic and campus life conducive, comfortable, and becomes ‘home’ for the entire academic community. With the increasing number of courses offered are all accredited, and also the internationalization program, students who are interested to enter UNTAD is increasing from year to year. UNTAD currently has 10 faculties and 54 courses for S1 level, while for S2 program provided 10 courses, and for S3 there are two courses. 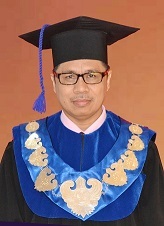 It is well known that there are high expectations of the people of Central Sulawesi against Tadulako in its mission as a provider of higher education in order to play a role in advancing and improving regional development, as well as expectations as a center for excellent value and moral force to face the changes and dynamics of development. University development strategy to carry forward the motto as ‘University of Carrier Changes’ or University carrier (Creativity, Acceleration, Reformation, Internationalisation, Entrepreneurial, reorientation) which will be the spirit of what direction towards RCU and WCU.